“Reef the main!” – Joris shouted. I got to the halyard while he leaped to the other side to the reef lines. The main sail started coming down, flapping wildly in the wind. I looked at the main. The middle part of it was out of the track. We were screwed. Did it just show 35 knots on the wind instrument? The rain was belting down so hard, it felt like hail. Or was it actual hail? It hung in the air like a semi-transparent blanket so we could barely see the land in front of us and some boats a few metres away. We were all totally drenched, not a single offshore jacket between us. “Let’s drop the main,” – said Greg and started the motor. “It’s not coming down unless I climb the mast!” – said Marco. It was a Friday twilight, another relaxed social race after a long work week. Only this time it turned out to be slightly less relaxed than normal. It started off as a beautiful sunny afternoon but as I was getting on the boat at the club we were staring at the horizon. “Some interesting cloud formations over there,” someone said as another lightning struck. It was clear we’d get soaked at some point of the race but none of us minded that much. The race committee (or rather our old mate Dave, the manager) chose the shortest course, and it was shortened even further after we started. It was dramatic enough for us from the start. A shorter course means that the division with biggest and fastest boats that starts last quickly converges with previous divisions. In the limited space between islands of the West Harbour it turns into dodge’em cars. Our troubles started even earlier though. As we were beating up to the top mark in a very fresh breeze, a boat above us seemed to bear down on us despite our yells. “Watch your rig!” – our skipper yelled as their mast leaned further and further towards ours. As we lost height, we got close to the mark and it turned out we had no room with two boats on top of us. There was nothing to do but bear away and do a 360. The two boats above us seemed to keep yelling at each other. We were now well behind everyone. It started raining soon after and hush fell over the water. No wind. We adjusted sails and moved crew weight around and we crept forward. Then the storm hit us. Nobody panicked. We had experienced crew that night and people knew what to do. It felt surreal to experience this kind of weather at a twilight but I caught myself grinning ear to ear. We sailed normally for a while, water collecting on the main and landing on my head on top of the torrential rain. Then we got even more wind and heeled more and more, it became clear we had to reduce our sail area – hence the call to reef the main. We did manage to get both sails down somehow, radioed the club and motored back. I looked at the blisters on my hands and thought of nothing but sailing. The raging flood of thoughts and helplessness that didn’t let me sleep the night before and gnawed at me all hours of the day that week, was gone. I looked at Chris’s 20 year old daughter who was a guest on the boat that night and smiled at her. “That was scary! I thought we were going to capsize” – she said in her English accent. As I explained to her that capsizing a sailing yacht is not that easy, I kept thinking that I wasn’t planning to do much on the boat that night as we had plenty of experienced people but ended up doing my regular job anyway with no debate from anyone. What a difference from when I first got on that boat all those years ago when it was a privilege to be a sewer rat who helped getting the spinnaker down through the hatch. How I fretted that I lost all my muscle strength, all my trimming knowledge while on maternity leave. None of it mattered that much in the end. I could breathe again. I could sail again. I did my first twilight race for the first time in almost 3 years. The club – probably the friendliest sailing club in Sydney, the place where I started sailing – has changed a little: there’s more open space and the facilities are much improved. There are still a lot of familiar faces around. Some have new boats. The boat that I used to own lost a mast a few months ago and still requires a lot of work. The main thing is that the place has the same wonderful welcoming atmosphere. It’s still very easy to get on a boat. There is always someone to chat to. The food is simple but satisfying and so are the drinks. I was on a boat I used to sail a lot on (and helmed on a Lady’s day race once). When I messaged the skipper, I wasn’t sure what I would be allowed to do during the race, seeing that I haven’t sailed for a while and the boat has always been quite competitive. Turned out that there were a couple of experienced people on the boat, a bunch of complete novices and a French guy who claimed that he knew how to sail but could not understand any of the instructions in English so I ended up doing most of the headsail trim and strings. Breeze is always temperamental in Balmain. It bends around islands and changes speed and directions in ways that make it tricky to predict what’s going to happen next sometimes. The forecast was for 20 knots yet it died completely towards the end of the race (that’s when the entire fleet caught up with us as we were sitting in a hole). I loved it all. The unpredictable wind, the feeling that I know exactly what I was doing, using my muscles, joking around, having a beer on a downwind leg (it’s thirsty work! ), chatting after the race. The breeze itself. That my foot got wet. That I was asked to do the rest of the season and then asked to crew on a dinghy again. It’s easy to see the appeal of twilight sailing – it’s social, mostly relaxed (although not without its own dramas) and it’s great to be on the water on a nice summer day. Sunsets are spectacular. All in all, it’s a perfect way to wind down after a week at work. For me it was also a gateway drug to more serious sailing that requires more skill and commitment and longer offshore races with their sleep deprivation, seasickness, lack of showers, risks of serious trauma or (if you’re very careless or/and unlucky) even death. When trying to explain the appeal of offshore racing (which could be very similar to explaining the appeal of climbing icy mountains – “because it’s there!”), I could only mutter something about the sense of accomplishment after you’ve finished the race while in reality I was mostly craving more of what I was getting at every single twilight: the feeling of mastery of a complicated skill, letting go of everything but the race, breeze on my face and the feeling of belonging right here and now, on this boat and with this crew. It’s unlikely I’ll be doing offshore racing any time soon (life is too busy!) so it’s great comfort to know that twilight sailing is still here for me. And it’s still magical. This year is almost over and what a year it has been for me. So incredibly tough at times yet I feel like I’ve grown for it and learned a lot in the process. Much of the learning was self-discovery. Around mid-year my dear husband who was worried for a while that I completely lost my identity while looking after our daughter, practically forced me to commit to doing winter series on a boat I sailed on (and absolutely loved it) previously. He was right in a way; I enjoyed the training and the first few races immensely and felt like I could recapture the magic that sailing has always been for me. I am grateful to him and to my in-laws who were looking after Riley as we both raced on different boats. Yet by mid-season we both realised that it was too hard to commit to it every Sunday. I missed my daughter and I was also physically tired after disrupted sleep at home and slightly disappointed by the dynamics on the boat at times where I wasn’t fully trusted to do my job (perhaps for a good reason). So we finished the season and decided not to commit to any other series for a while. Both my daughter and my work required extra attention this year. The year started with Riley’s surgery to remove her adenoids after a sleep study late last year and while the operation is quite minor and the recovery was fast, general anaesthesia is a terrible thing for a one year old and her parents. After the surgery she stopped waking 20 times an hour and by the end of the year started occasionally having nights when she only woke up once or twice (every two hours is still the usual). A week after the surgery Riley started transitioning to childcare while my mum was packing up to go home after a three month stay. I can honestly say that was almost worse than the surgery and I cried every day, doubting everything. She adjusted and grew to love her childcare and the carers. She’s known to be very confident, engaged and vocal at childcare and also very happy. Dropping her off there is still the hardest thing I do all day. She also went through a period of severe separation anxiety towards the end of the year; refused to sit in the pram; grew into a very independent but affectionate little girl. She’s an absolute delight most of the time and still very active and funny. I, on the other hand, started feeling way more confident and competent as a parent and stopped doubting myself all the time. I can honestly say that parenting taught me more about self regulation, patience and respect than anything else I lived through. Not that I think that I have it all figured out, in fact I often feel overwhelmed still but I now think that it’s normal for parents in general. We also finally gave up and got a cleaner. At work, I started a new role and it was not the easiest transition; it took me a while to get into the swing of things and find my own path for a number of reasons. I had a period of severe bewilderment about some things I saw around me; I was also told that some of it was part of a 3 year crisis of being at the company. I continue to be very grateful for opportunities within the company and I’m overall happy and optimistic now, at the end of the year, and very keen to see how different things work out and what I can achieve within the boundaries of the role. Perhaps the biggest surprise for me was that I immensely enjoyed working with one of our incredibly bright graduates. A few friendships really deepened and flourished this year and I couldn’t be happier about it. The place we are renting got sold to an investor with minimum of fuss so we are cautiously hopeful we will be able to continue living there until we are ready to move on. I tried to read deeply not widely this year and I started writing occasionally again. I also found an online community I find a tremendous value in. One of my favourite places online, the forum that inspired me to learn English properly back in the day, was shut down by its owner which caused quite a bit of controversy for a month or so. By the end of the year I also took the plunge and deleted apps for Facebook and Instagram off my phone and every time I do check Facebook I realise it was the right thing to do. I do miss seeing my friends’ news but I’m also less distracted and spend less time arguing with imaginary people in my head after reading a silly article in my feed or thinking why I wasn’t invited to an event (which I probably wouldn’t be able to go to anyway). I hope all of you who happen to read this have a wonderful holiday season and have some time for reflection, laughter, rest and time with your loved ones. Here’s to a great year 2019. Sydney winters are an interesting time to sail: an “average” day of 10 to 15 knots is rare but you get a lot of extremes – days with almost no breeze (and at times some sunshine to compensate but that’s not a given) and days with so much of it that races are on the verge of being cancelled. Race 2 of the Winter series had us sitting in a hole for ages as our entire division caught up to us and then overtook us; the forecast for the next week looked like a complete opposite: gusty 20-30 knots and rain. Race 3 was also on Mother’s Day. We had a long and very warm summer and autumn this year so the first cold days came as a complete shock. I generally find myself unable to complain about the cold too much because even after living in Australia for over 10 years I still hear that a Russian person, let alone a person from Siberia, can’t possibly feel cold in 10 degrees. I just glare from under my fur hat. Just kidding, I just sit there with my eyes closed. Inshore races generally get cancelled when there is a gale warning and I’m not going to lie, I was waiting for that warning with almost the same trepidation I feel as I wait for my toddler to start sleeping better. A cancelled race, some restful sleep and being able to read all by myself with a cup of hot tea were the only things I really wanted for Mother’s Day, and I was pretty sure I wouldn’t be getting the last two things. So when the committee announced that the race would proceed it was a blow. I saw no possibility of cancelling and just not showing up either. Sailboats really need crew on windy days (especially heavy crew so you should have a big breakfast if it’s blowing outside) and pulling out on a windy day is bad form. So I cursed and put a lot of layers on myself and used my Russian glare on the Uber driver who thought I was a tradie wearing some kind of work clothes when he saw my wet weather gear. And man, did we had some fun that day. I got to sail with a couple of people who I haven’t seen in a few years, people I really like, and all the usual suspects. We didn’t break anything. There was a lot of grinding involved and a lot of splashing but I managed to stay dry. We forgot the only spinnaker we could’ve used (a fractional symmetrical kite). We put a reef on and then shook it out. I was shouting “weeeeeee!” through every gust of 35 knots. We rounded up a few times and we had to crash tack because of a boat that appeared seemingly out of nowhere. I lost another hat. And after the race tea and red wine tasted better than they ever did before. Turns out I don’t mind an inshore race in 30 knots, after all. Thanks Bureau of Meteorology for not issuing a gale warning and thanks CYCA for not cancelling the race, obviously you know better than me what’s good for all of us. I had a long break from sailboat racing, from the early days of my pregnancy until my daughter was almost a year and a half. Partially it was because becoming a parent turned out to be an all-consuming task not leaving time for much else, especially in that first year (babies generally like having their mothers close by at all times and I was happy enough to oblige), but there was also a bit of fatigue involved. My boat ownership was a mixed bag of exhilaration at its best and frustration and hopelessness at its worst. The older boat required a lot of patient investment of time and money culminating in a replacement of the keel and while I got some help from friends I was never competent enough to do any repairs myself and wasn’t cashed up enough to delegate them to someone else entirely. What was even more painful, even with experienced crew I never got to the point when I felt confident enough as a skipper of a sports boat – every time a race came around I would be obsessively checking the forecast worrying that I would lose control of the boat and smash into someone else or that something would break and hurt people in the process (de-masting is not all that rare even inshore). I had an experienced crew, by far more experienced than me, and sometimes it felt like I was an impostor on my own boat. I suspect that if I had enough time and persistence to stick with it and maybe forget about being competitive for a bit and concentrate on the basics instead of overthinking everything, I’d eventually get to the point when sailing my own boat would entail more fun than fear. As it happened, the boat sat on a trailer for a bit until I finally got the keel replaced, got back on the water… and then I got pregnant and sold it. My consolation is that the new owner is taking better care of the boat than I could and yet regret lingers. My experience racing on other people’s boats somewhat changed, too. I lost my desire to prove myself to everyone and started concentrating on the actual sailing with people who already knew me. I can’t say I’m the best trimmer out there but I can do a decent enough job and did so on a few boats. I didn’t entirely lose my competitive streak and sometimes I did wonder if I could sail on a bigger boat – yet the effort required to strategically socialise with people to claw my way in and then try to prove my worth was too big in my head to even try. My break from racing changed it even further. I got back on a boat that I sailed on for a while previously and I love the owner and his partner as well as the crew, old and new. It might not be the most competitive boat but it’s also entirely free from politics. There’s no “easing” off the boat, no power struggles, no blaming or shaming, no desperate drive to win at all cost and do everything within your power or else feel like a failure – it’s just fun. Easy-going banter, trying out ALL the sails, laughter and booze. We will get more competitive soon I’m sure but for now I am just enjoying the feeling of sea breeze on my face, the camaraderie and being back on the water – that’s what it’s all about, after all. “We changed the block on the main to a double one so it’s easier for you to control,” – said Jony. I was sitting in the driving seat of a paraw, a traditional boat in the Philippines. 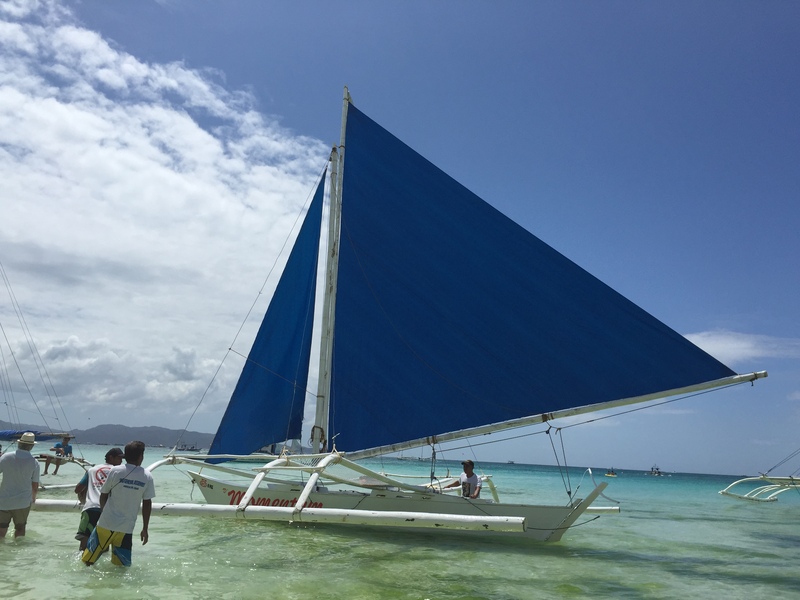 Those boats are out on the water all day in Boracay, taking tourists around the island and out to the reef. Around 4:30 pm their renting rates double as the sun starts to go down. By 5:30 the entire horizon is full of blue sails in the rays of yet another stunning sunset. By the time I decided to try and control one of those boats my holiday was almost over. The very next day I was flying back to Australia and my parents were heading back to Russia. I missed three twilights on my own boat while being on holidays and felt very homesick every Friday from 6 pm Sydney time onwards, checking the results to make sure that my crew were destroying my handicap while I was away. They were. I am the least experienced person on my own boat so it was to be expected. The crew posted photos of the trophy glasses, rum and beer on my Facebook wall to celebrate another win. 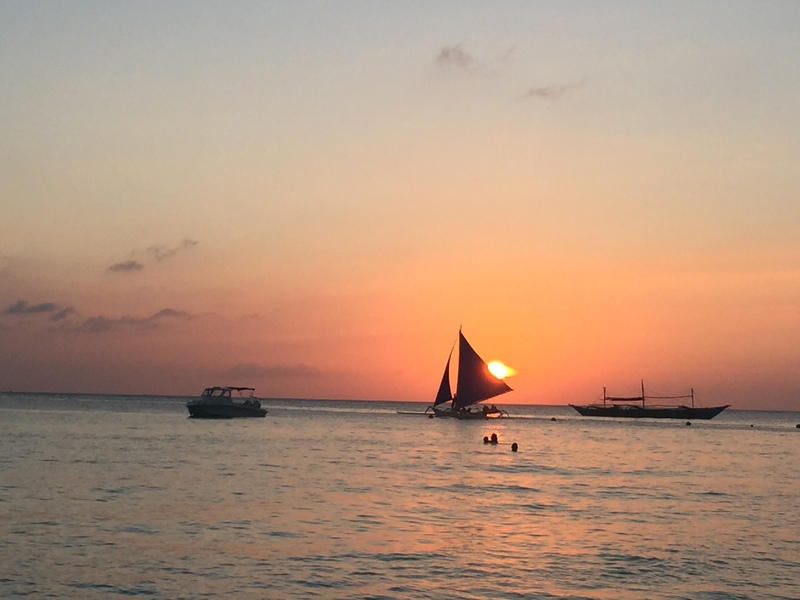 I was staring at the perfect beach on Boracay, drinking cocktails and thinking about what I left at home. The White Beach is about 5 kilometres long and it’s covered with – you guessed it – very fine white sand. We would usually drop our towels under a beautiful big tree and go swimming or paddle boarding. The beach is full of hawkers, mostly selling sunglasses, hats and selfie sticks. Lots of them also sell water sports, including a cruise on a blue sailed traditional boat with two outriggers on each side. They didn’t call the boats “paraws”, at least not while talking to tourists (I had to look up the correct name on Wikipedia). Filipinos speak fairly good English in general but a lot of the time their vocabulary is very functional, just enough to sell whatever they are selling. I still managed to talk to a few sailing people who described capsizes around marks during races, explained divisions in regattas and talked about sponsors and money prizes. Jony was probably the most talkative hawker and he was the one who convinced me to try to steer the boat after my parents and I had already gone on a couple of cruises. “There was this woman from Singapore who told me she’s a sailor,” – he told me. “But when I tried to get her to steer she just wouldn’t do it!” I knew then that I would have to do better than the unnamed woman from Singapore, even though I’ve been told that I was not allowed to capsize the boat. Jony was late on the day when I was supposed to take the boat out. Other people from different boats said hi to me and suggested to go on a cruise with them instead but I decided to wait. When he finally showed up, he was wearing a short wetsuit. “I thought I was not allowed to capsize?” – I said. “Just in case,” – he answered. Mum looked at me anxiously and asked me to be safe. I was pretty sure she didn’t know what “capsizing” meant and it was something to be grateful for. When we got on the boat, both sails were already up, two local boys looking at me curiously. Jony decided to get the boat out of the busy area before we swapped places. When I finally sat down in the driving seat, I was excited but cautious. There is a rudder but no tiller on the boat – instead, you have to pull on ropes on each side of the hull and do finer control with the sails. You can’t really see the headsail while sitting down. There are knots along the headsail sheet that allow trim for a particular angle. No finer controls, no boom vang or cunningham, no lead cars or outhaul. No telltales or a windex, it’s driven entirely by feel. First time I tried to bear away in a gust I was not very successful. The weather helm was impressive but easing the main didn’t help much. “Don’t ease, you are losing power!” – Jony said. We were reaching at around 10 knots in 15 knots of wind, and the other two boys were jumping on the outrigger making encouraging noises and yelling “Faster! Faster!” The other outrigger lifted out of the water, waves splashing over the bow. “Um, I guess burying the bow is not that big of a problem on this boat?” – I asked Jony. “No, never had a problem with it.” – He reassured. Jony lives on the mainland and catches a boat to Boracay and back every day. He asked me not to gybe. My first tacking manoeuvre turned out to be fairly easy – I had enough momentum not to stall the boat. The second one, however, stopped midway so Jony had to backwind the jib. I wasn’t too concerned though as every single tack during our previous cruises was like that. Soon enough I was able to bear away again and we reached back with a lot of splashing and lifting. “Do you know Harken?” – Jony asked when we got back. “Not exactly cheap in Australia either,” – I said. He gave me his postal address anyway, just in case. When I connected to Wifi, there was a bill from a rigger in my email inbox and a Facebook message from my main trimmer. “You gotta learn to sail your boat by feel,” – the message said. “That’s how you become a good sailor.” I could still feel the breeze on my face and my palms holding the main sheet without gloves. I closed my eyes. A week later I would race my own boat again. I didn’t feel very lucky. 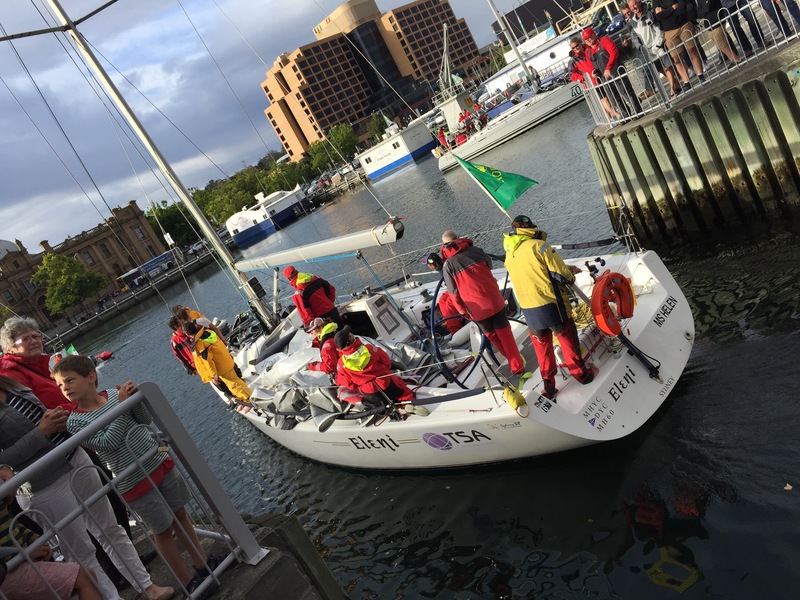 That was my first time in Hobart, and the original plan was to get here by boat as part of the 70th Sydney to Hobart race, yet we had to abandon 2.5 hours into the race due to mechanical problems with the boat. “There is always next year,” – said the cab driver, echoing numerous other people, and I nodded and smiled. The flight from Sydney to Hobart takes less than 2 hours. The record on a sailing boat is currently 1 day 18 hours and 20 minutes. I was on a much slower boat than Wild Oats that still holds this record, a boat in the slowest division, so we would still have been in Bass Strait by the time I landed, had the circumstances been different. As it was, I was going to watch a few of my friends finish the race and celebrate with them. 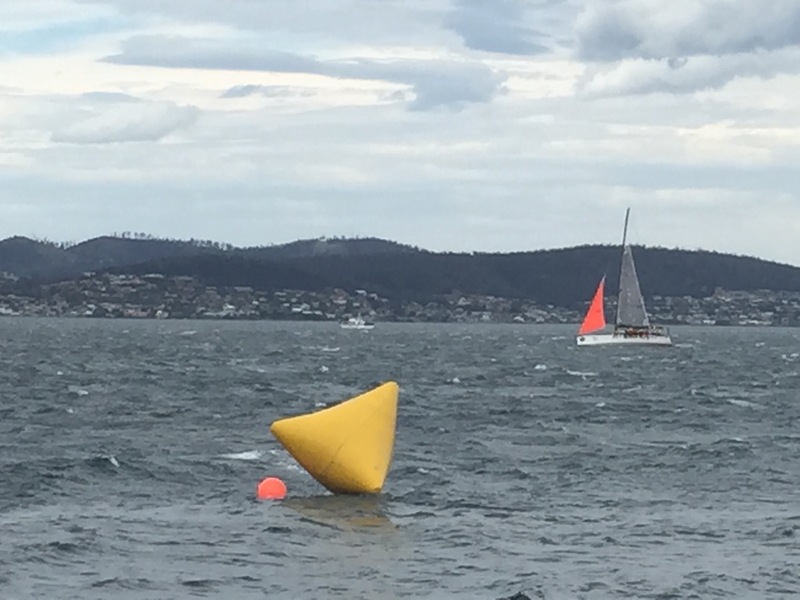 Despite abandoning the race, I still had a crew pass with my name on it to get into the sailing club in Hobart but almost nobody goes there after the race. After parking the boat in the Constitution dock, most crews head straight to the Customs House Hotel across the road. It’s a nice coastal walk from the club to the dock despite a fairly steep hill at the start of it, and as I was walking I couldn’t help but wonder what it would be like to see my friends finish the race. I was tracking several boats’ progress; Southern Excellence (Volvo 70), Khaleesi (DK 46), Dare Devil (Farr/Cookson 47), Pazazz (Cookson 40) and TSA Management (Sydney 38). I wished my mates who were sailing these boats well and I was cheering for them as they climbed up the IRC standings. It was still hard not to think how unfair it was that we were out of the race so fast that we didn’t have a chance to make a single mistake let alone experience the race in full. And as I read reports about other boats having issues and abandoning the race I couldn’t help being a little comforted by the fact that we were not alone; I was not proud of that feeling and I hoped to shake it by going to Hobart and by celebrating my mates’ achievements – instead of my own. My first glimpse of the finish line was sudden. I saw a boat before anything else; then I saw the yellow buoys. The rain was over yet there were white caps and huge gusts all over the water. The boat was carrying a storm jib and deeply reefed main and it was till heeling a little too much as gusts hit it. As the boat reached the finish line, there was a loud horn sound from the tower and a few people gathered on the shore clapped and cheered. And I cheered too. My friends from Khaleesi were due to finish about half an hour later. They chose the right side of the course and were tacking painfully all the way to the line; my heart was racing as if it hoped to win, too. My eyes tingled and my chest felt too full as if I breathed in too much air. I was extremely happy and unbelievably upset at the same time, the bitter-sweet combination normally alien to me. I clapped and I cheered and I ran to the Constitution dock to see the boats come in and I hugged my mates and congratulated them on what they had achieved. They were tired and sunburnt and their lips were dry and blistering from the sun. They grumbled that they could’ve done better as I helped them pack their storm jib. They didn’t want crowds and cheering as they were rafting up at the dock. They told me there were sorry about what happened to our boat. We were lucky that our rudder gave out when it did and not in Bass Strait; we couldn’t have done anything to prevent it. Yet all the reasonable explanations and logic fade in the face of a major disappointment, when you try to come to grips with reality; reason is just not enough sometimes. And amid the stories of my friends being hit by unpredicted 50 knots, about owners and unreasonable crew members, about code zeros dragged behind the boat and 30 knot boat speed, amid all the drinking, rum, beers, wine, amid the crowds that felt like CYCA without non-sailing people, amid all the noise and conversations, I felt like I was still part of it all; that despite being heart-broken I could still go on and be happy – genuinely happy – for the friends who have completed the race and weren’t robbed of that achievement.